The directors of Law League are delighted to announce that a significant milestone has been passed by the business this week with over 500,000 answered questions from UK law firms’ clients and staff in our unique benchmarking database. Law League is the legal market’s only feedback survey which automatically benchmarks a firm’s results anonymously against their peer group to highlight strengths and weaknesses. 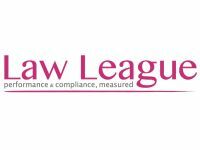 With membership starting at just £100/month and no minimum term, Law League provides excellent management information that every firm from sole practitioners to the Top 50 will benefit from. For more information please visit us at www.law-league.com or call us on 01373 814773.